This ransomware is a variant of Encryptor RaaS, a popular Ransomware as a Service (RaaS) that came out in July 2015. RANSOM_CRYPRAAS.B is known to encrypt files on Linux servers, as well as desktops. 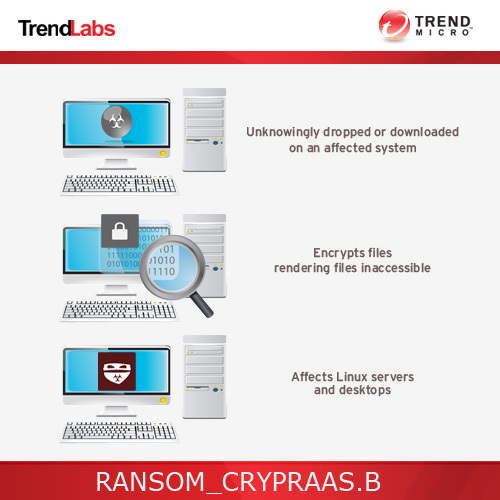 Scan your computer with your Trend Micro product to delete files detected as RANSOM_CRYPRAAS.B. If the detected files have already been cleaned, deleted, or quarantined by your Trend Micro product, no further step is required. You may opt to simply delete the quarantined files. Please check this Knowledge Base page for more information.